We lost Mom and our brother this year. It has been a very hard to go on but we must. In October I brought home my mom's Dept. 56 Snow Village and since I hadn't seen it set up in a decade or more, I was excited to get it unpacked and enjoy it. By Halloween it was up and running. I even took down Halloween decorations to set it up! One thing led to another and I started to make penguins for the winter season and since my living room jewelry desk adjoins the snow village it was only a matter of seconds before the penguins ended up in the snow village and I found myself taking their pictures. 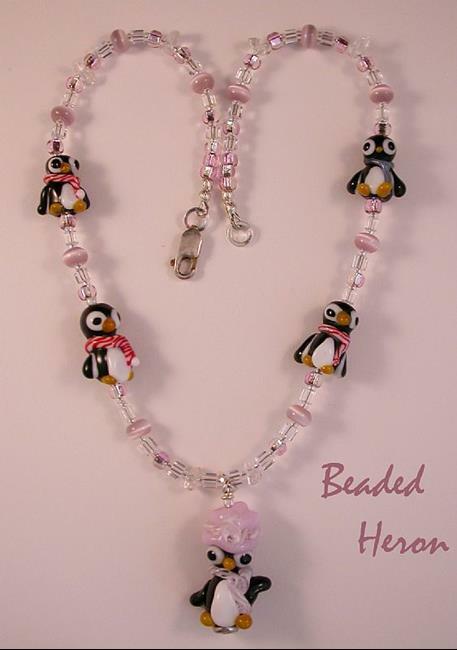 Of course pictures need a story so I started to write a little scenario to accompany the necklace penguins. Several Penguins were spotted at Big Bill's Service station at Snow Village in the shopping district this morning The first two known Penguins of this year's invasion were spotted last night in, of all places...the skating rink! Throughout the night, word rapidly spread through the town that Snow Village is a sleepy little place, and there was barely a soul on the streets after dark! 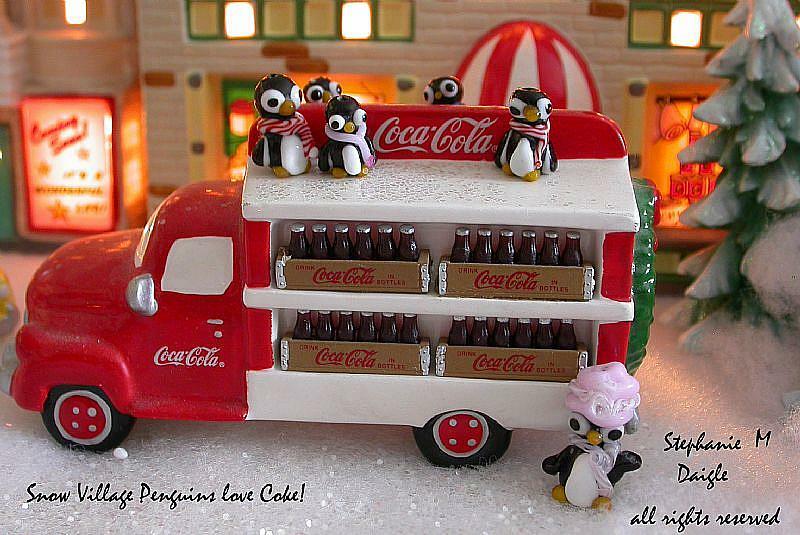 More Penguins began to arrive and they had a party that lasted into the wee morning hours. 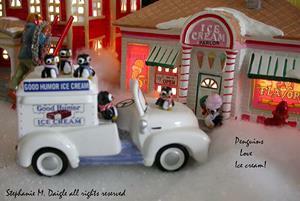 Penguins soon took over the town of Snow Village as the people fled to places unknown. You will see them hanging about town like they own the place. 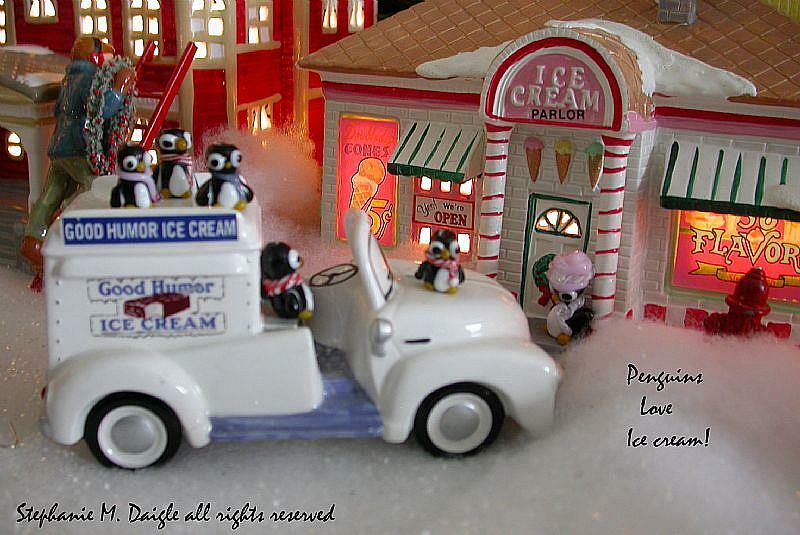 The penguins have been seen taking over the ice cream store and shopping for Christmas trees! 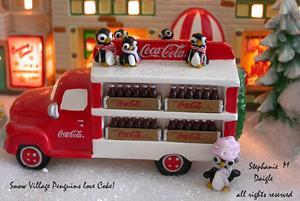 They were also reported to have taken over a Coca Cola truck in the business district. Caroling Penguins can be seen in the neighborhoods all over, and even the town police have given up on trying to stop them. 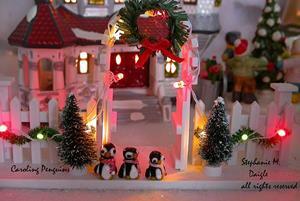 And so it was... the sleepy little Snow Village is a place where both people and penguins can live happily ever after. Each of my beads is lovingly hand made, one at a time, using 104 coe Italian glass and the flame of my Lynx torch. My beads go directly into the kiln for a proper annealing bath, which will help ensure that they last until the end of time. Of course, we are talking about glass, and some care must be taken with it to help ensure this end. It was an exciting adventure from start to finish and it was so much fun being up close and personal while doing this, with something that my mother dearly treasured. 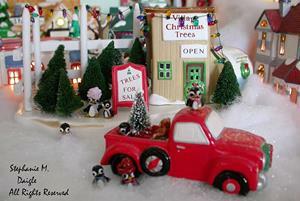 Penguins were seen shopping for Christmas trees!